A group of bicycle manufacturers, in cooperation with the Consumer Product Safety Commission (CPSC) and the Bicycle Product Suppliers Association (BPSA), is engaged in a safety recall involving quick-release devices. 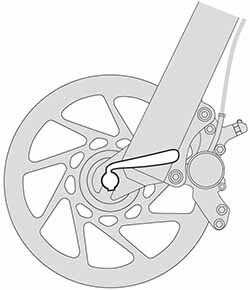 When improperly adjusted or left open while riding, the quick release device may potentially come in contact with the front disc brake rotor. If this happens, the front wheel could separate or come to a sudden stop and the rider could lose control of the bicycle, posing a serious risk of injury. The bike models sold by L.L.Bean that may be affected were manufactured by Specialized, GT and Felt. To determine whether your bicycle is affected by this recall, visit http://quickreleaserecall.com/. This website provides helpful details, videos and instructions on how to diagnose and proceed if affected. If your bicycle is affected by this recall, please stop riding the bicycle immediately. You may visit the L.L.Bean Bike Boat and Ski shop in Freeport, Maine for assistance with this recall and repair. If preferred, you may visit your local Felt, GT or Specialized bike shop for assistance. As always, our 100% Satisfaction Guarantee applies. If you are not satisfied with this product for any reason, please contact us for assistance with returning it for your choice of a full refund or a gift card.